TIPS ... stitch count What are your tips re: keeping the correct stitch count? What are your tips re: keeping the correct stitch count? count… count… and count ..
Stitch count is something I really struggle with. Hence the reason why I don’t do ripple afghans. I know they’re simple, but I always end up with one edge missing stitches and progressively getting narrower as I move up. I just did about three skeins worth of a small cluster stitch baby afghan before I decided it was too wonky to continue. I’m doing another pattern and pulling out the old stitches as I make the new ones. Not sure what the problem is. I seem to do fine with more complicated patterns. for me, it is often that first stitch … what counts as 2 from the hook or three, whatever is required. maybe doing a sample patch and take a really close look at those beginning stitches (and end ones) to get to recognize what those stitches look like. Stitch markers are very helpful when you work in the round, or you can also use color contrasting yarn to mark your stitch. When I work ripple pattern I always make sure to count the stitches just to make sure I have the same stitches for every row (I do this only for the first 3-5 rows),I go along easily for the rest rows. I find this is easier and less stressful than to rip over my work at the point when I am too far to return back to fix it. 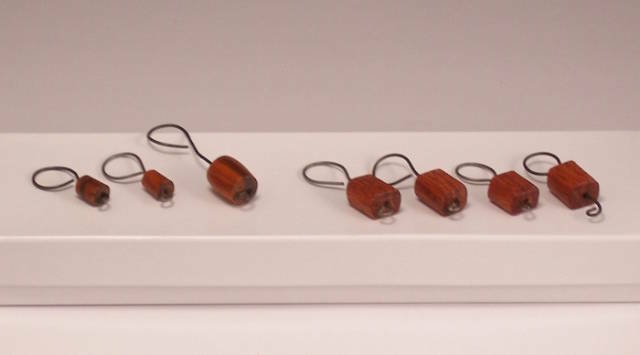 I made stitch markers today out of scrap bits of Tineo wood and Bloodwood, just bending wire to hold them. Very easy to make one’s own. I knew you’d come up with something pretty!!! Hi, Have tried using paper clips and safety pins. BUT the easiest, I have found, to use are bobby pins. They work great and are cheap!! someone (somewhere on the internet) mentioned bobby pins as well.. sounds like a great idea. I also thought about baby hair clips that snap shut/open. .. small / easy to use. I don’t know if this is the way to do it, but when I do a ripple afghan, I do the chain three (for the first dc) of the next row and then I do a dc in the same stitch as the chain three comes from, then when I come back to that dc and chain, I just do one dc in the top of the dc and completely ignore that chain 3. I have never found this to fail when doing ripple afghans, or for that matter for any large project that you want to keep an even edge on. If you follow various instructions on different patterns you are never quite sure what that count is, but if you do that turn ALWAYS the same way, your edges will be perfect.